Adda52.com is well-known to run the best online poker tournaments and promotions in India that makes online poker experience worth it for the poker lovers. What’s great about Adda52 promotions is that they are entertaining yet competitive, and challenging yet rewarding. Let’s see what the largest online poker site has to offer in this sizzling month of May. PMT 10 PM: Big Tourneys never end. This month the most awaited “Poker Millionaire Tour” is back with a bigger prize pool of Rs. 16 lacs every fortnight on weekends. So, gear up and stack up your fortune. 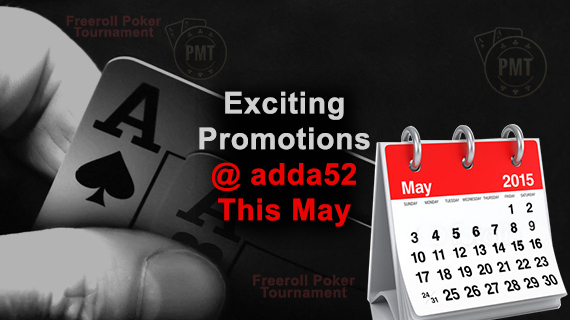 IOPT: Adda52 “INDIA ONLINE POKER TOUR” is here to stay! Join the action on May 22 & May 23, and win upto Rs.2.75 Lacs guaranteed. PFOL: Pocket Fives Online League is a freeze-out tourney where smarter poker players out there will be rewarded. So brush up your poker skills and get a chance to win Rs. 25,000 on May 10 and May 24.
iPhone 6+ Finals: Want to own the world’s most desirable mobile phone – iPhone 6+? Yes, you can join the freeroll iPhone 6+ poker tournament with complimentary tickets “IPH6FREE” or 50K Practice Chips. The tourneys stated above are just a sprinkling of this month, and there are many other promotions also running this month. These include Mid Day Dual, Midnight Bash Series, Mega 10 Prime, 100x Wed Blast and so on. You can also visit the Adda52 Promotions Tab for further details.